I come across Katy Perry’s song and though I’m not a fan, I fall in love with the lyrics. I know I can apply them to myself. I think of my resolve to write every day and I tell the world: Hear Me Roar! Yesterday, I told you why August is special for me. Yes, I’m a Leo. And you’re going to watch me roar here. I’m recommitting myself to authenticity, so you might find me blogging on some ‘not so pleasant’ topics. No I don’t want to be sensational or hurt anyone, but I want to tell it like it is. 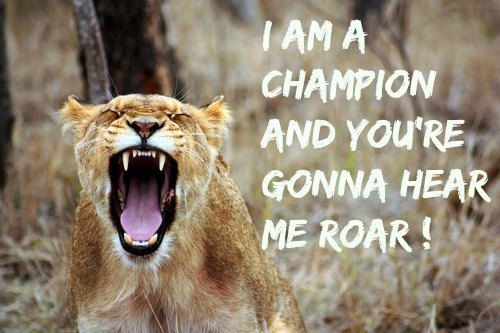 Yes, I’m a champion and you’re gonna hear me roar! Remember, you’re a champion too – don’t ever forget that! Waiting for bold and authentic servings here, all through August! Love!! My son , too, is a Leo. and the roar of the lion can be heard around for miles. More power to our Write Tribers. All the best and like Vidya says more power to you! All the best and more power to you. I am sure you will ace it!